If you think the 1.6-litre Megane GT is a little mild-mannered for a performance hatchback, fret not. 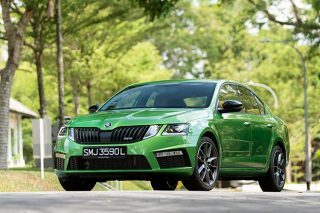 The real McCoy, the Megane RS (Renault Sport), will return to Singapore by the middle of this year. 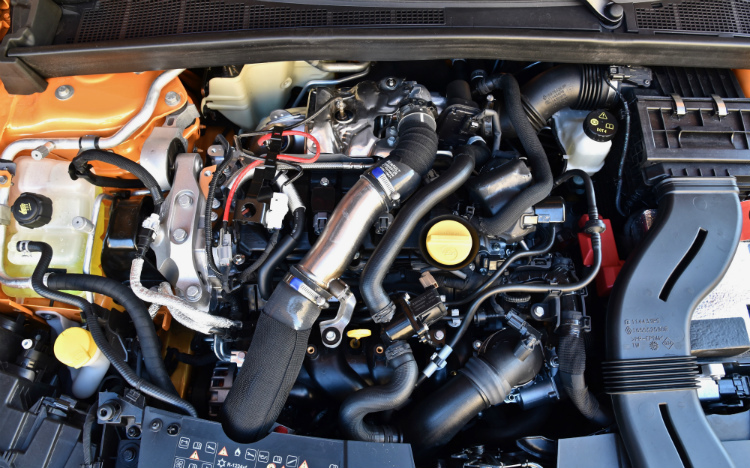 Based on the current Megane, the third-generation RS version gets a downsized 1.8-litre turbocharged engine instead of the previous 2-litre turbo unit. Why so? Apparently, to comply with more stringent exhaust emissions and fuel efficiency standards. This is the same Nissan-Renault Alliance 1.8-litre motor in the mid-engine rear-drive Alpine A110 halo sports car, but boosted in the front-wheel-drive Megane RS to produce 280hp (up by 28hp) and 390Nm (up by 70Nm). That’s a lot of power and torque, even more than on the previous-generation 2-litre Megane RS265, which produces 265hp and 360Nm. Sporty “R.S.” touches are combined with useful features and supportive front seats to make this a practical Parisian pocket-rocket. That’s enough for the latest RS to outsprint the VW Golf GTI to 100km/h by 0.6 of a second, clocking 5.8 seconds in a rush. 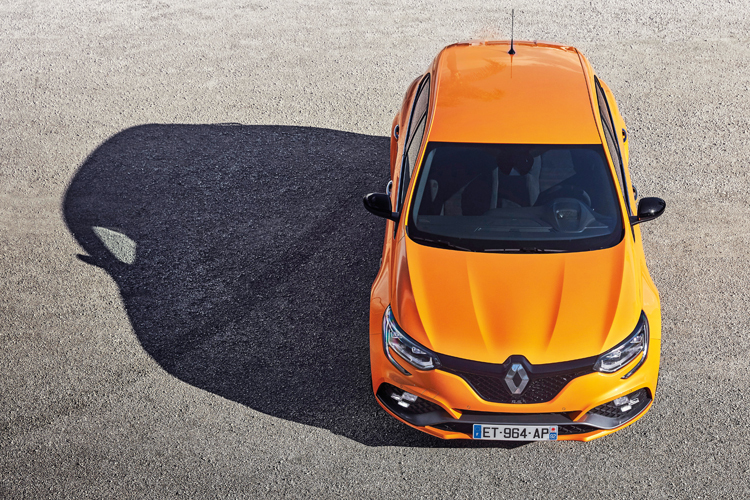 And for the first time in a Megane RS, there’s an optional dual-clutch transmission to widen the market appeal of the newcomer. It’s a Getrag 6-speeder called EDC. Previous Megane RSs were only available with a manual gearbox. Greater power also requires greater control. 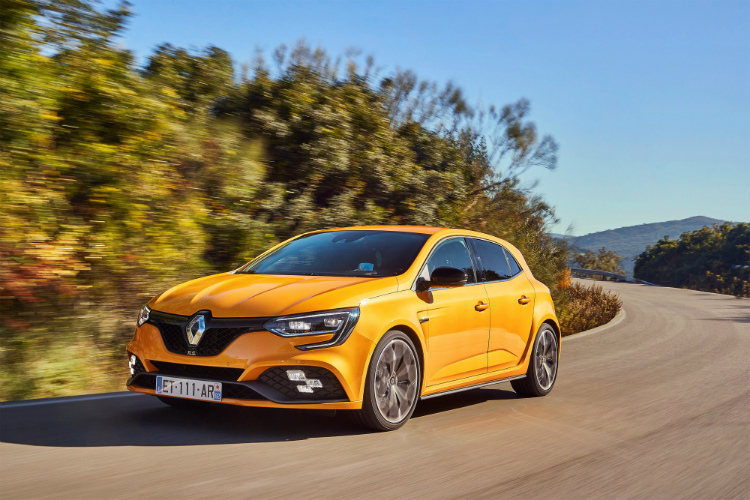 For that, the Renault Sport team has fitted the Megane RS with four-wheel-steering (the Megane GT gets it, too), which is typically featured in far fancier performance cars such as AMGs, Ferraris and Lamborghinis. Renault’s system, called 4Control, enables the rear wheels to turn in the opposite direction to the front wheels, by up to 2.7 degrees. 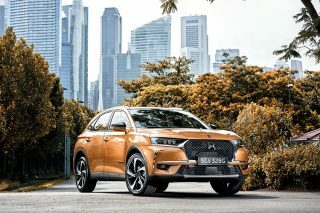 This effectively “reduces” the car’s wheelbase and makes for smaller turns in tight spaces, along with better agility in fast bends. In fact, the car’s nearly neutral turn-in with the mildest of understeer is quite uncanny for a front-drive hot hatch. And this handling characteristic may take getting used to. Inversely, at speeds above 60km/h (or 100km/h in Race mode), the rear wheels turn ever so subtly, up to a one-degree angle, in the same direction as the front wheels, for improved high-speed stability. With the standard Sport chassis, the front axle gets electronic torque-vectoring, further limiting understeer and improving traction while exiting corners. The Brembo brakes are bigger now, with the front discs upsized by 15mm to 355mm for surer stopping power. But I’m not sure about the squeaky sound made by the brakes when light pressure is applied to the pedal. In the cockpit, there is the now familiar Renault 8.7-inch R-Link 2 touchscreen infotainment tablet loaded with selectable drive modes, along with a customisable 7-inch TFT LED instrument cluster. 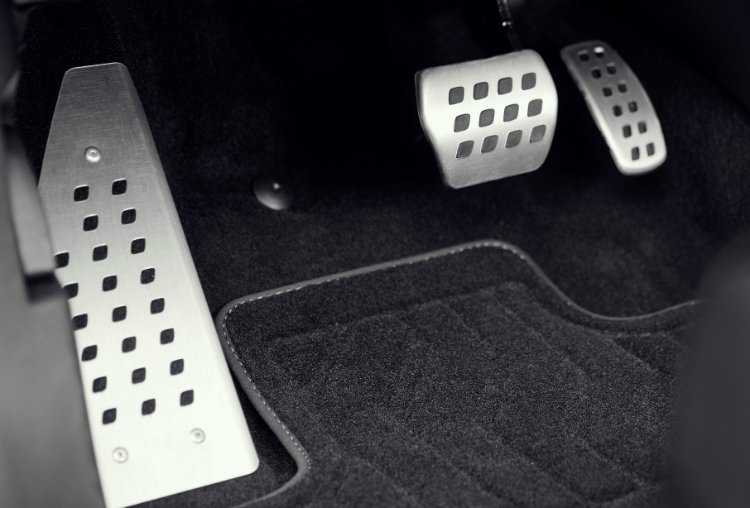 The Multi-Sense system offers five drive modes – Comfort, Neutral, Sport, Race and Perso. I wouldn’t select Comfort mode, because its eco-oriented gait is too relaxed for the Megane on a hot-hatch mission. Neutral is ideal for daily commuting because the steering feels a little light in this mode, but the rack remains accurate and quick, with 2.2 turns lock-to-lock. Sport mode clearly quickens the Megane’s response, firms up the steering and amps up the burbling soundtrack, complete with pops and crackles from the exhaust pipes, as though they’re “powered” by a bigger engine. 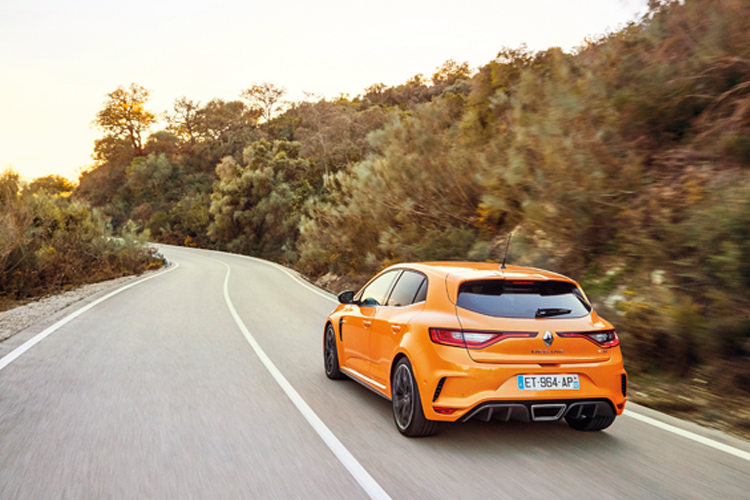 Race puts the Megane RS into hyper-pace, with an even louder soundtrack, but this is best left for track days as all electronic nannies are off in this mode, save for the ABS. Perso lets you perso-nalise the vehicle’s drive settings and driving aids. Regardless of drive mode, the damping remains unchanged. 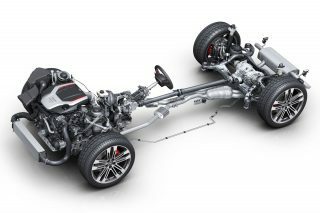 Even without electronically controlled dampers, and riding on seemingly rudimentary front struts and rear beam axle, the Megane can offer Renault Sport chassis magic in the form of bump-stop hydraulic compression shock absorbers. This rallying-inspired technology is described by the automaker as “a shock absorber within the shock absorber”. The double-dampers effectively cushion the Megane RS over speed bumps, potholes, rough roads, and even when clipping over trackside chicanes. 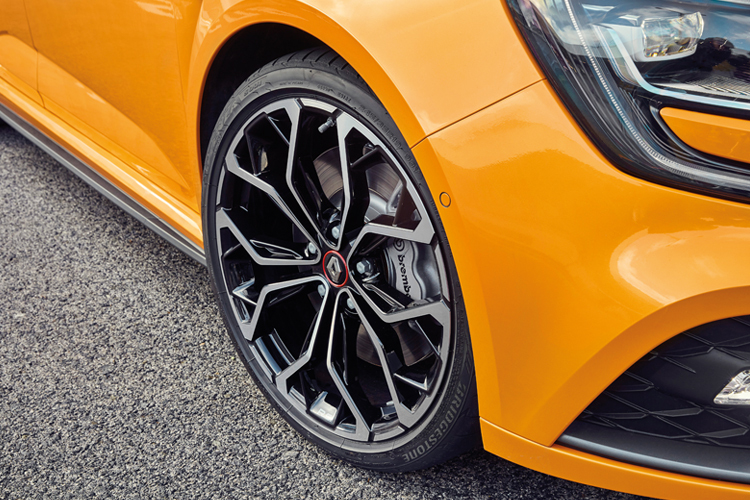 Amazingly, the RS’s ride quality is touring-comfy, even on optional 19-inch wheels shod with ultra-low-profile 245/35 R19 tyres (standard fitment size is 235/40 R18). Achieving a brilliant balance between comfort and composure is still a French forte. Not so brilliant is the dashboard’s R-Link touchscreen. Accessing the various features is not entirely intuitive, and it’s a learning experience to peel through the several layers of submenus. The GPS navigation system is also slow to respond. Much easier to use is the “R.S. Drive” hot key that provides a quick shortcut to the Sport mode (short press) and Race mode (press and hold). 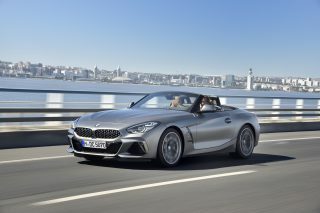 In both modes, the left paddle can be held for rapid multi-gear change-downs by the dual-clutch gearbox. 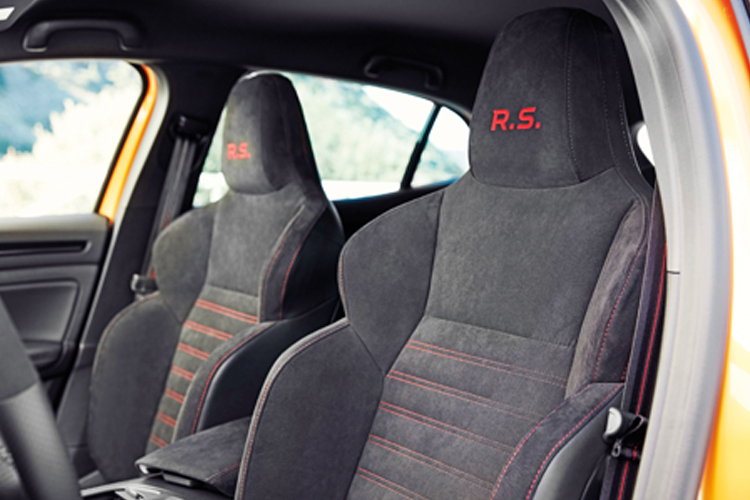 If you’re in a naughty mood and in Race mode, just a single touch of the R.S. Monitor would have the Launch Control primed and ready for a jackrabbit start, accompanied by squirmy steering on take-off. High-back Alcantara sports seats, similar to those in the Megane GT, offer excellent lateral support, with RS-spec contrast red stitching in place of the GT’s blue stitching, plus a sprinkling of mock carbon fibre, which is a little contrived in my book. The three-spoke steering wheel is trimmed in leather and Alcantara, with a big red “R.S.” logo at the 6 o’clock position and a red “directional” stripe at the 12 o’clock position to accentuate the wheel’s sportiness. As in the Megane GT, the paddle shifters are a pair of longish blades mounted on the steering column. They stick out awkwardly from behind the steering wheel – presumably so you don’t accidentally flub the retro audio-control fob just below the paddle on the right during fast cornering. For all its tuning by Renault Sport, the Renault Megane RS is still a practical five-door hatchback. 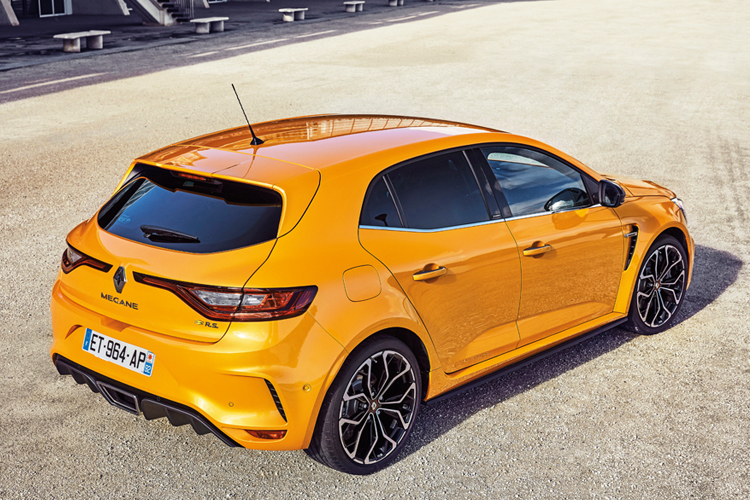 For all its tuning by Renault Sport, the Megane RS is still a practical five-door hatchback. There’s enough cabin space for five adults and the cargo capacity can be expanded by the 60:40 split-folding rear seats. 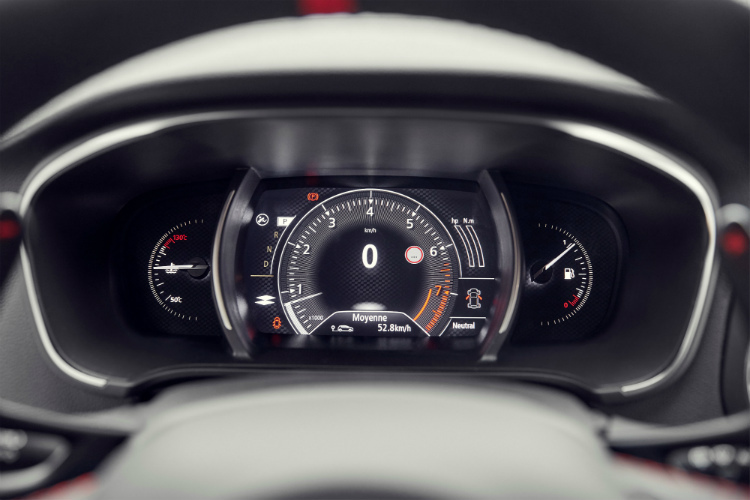 It is not clear which niceties will be in Singapore’s new Megane RS, but the driving aids and safety gadgets include adaptive cruise control, active emergency braking, safety distance warning, blind-spot warning and even speed-camera warning. 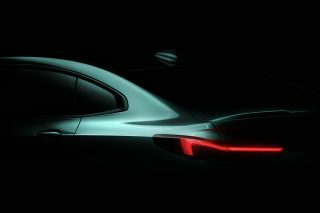 The car can be equipped with a colour head-up display, hands-free automated parking and a rear view camera. 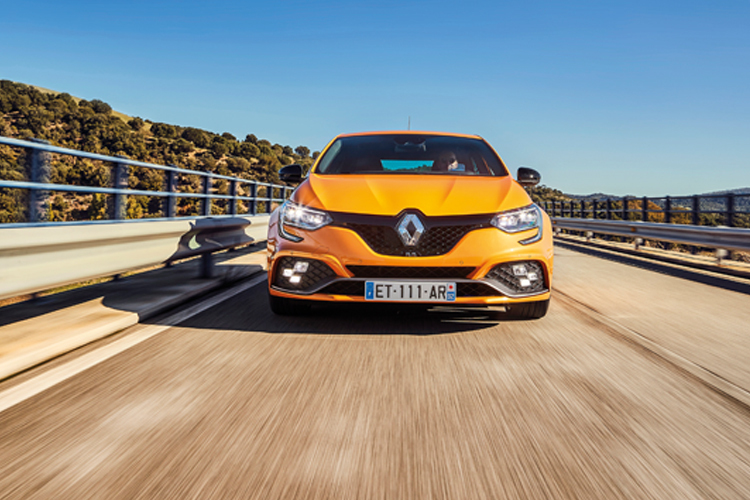 The speed-cam forewarning system is especially relevant, as this Renault is capable of cruising at alarmingly fast speeds with absolute composure and impressive refinement. Only wind noise above 120km/h intrudes into the otherwise quiet cabin on Spanish highway stretches – aside from the burbling engine chorus, of course. The RS can be easily distinguished from its lesser GT sibling. 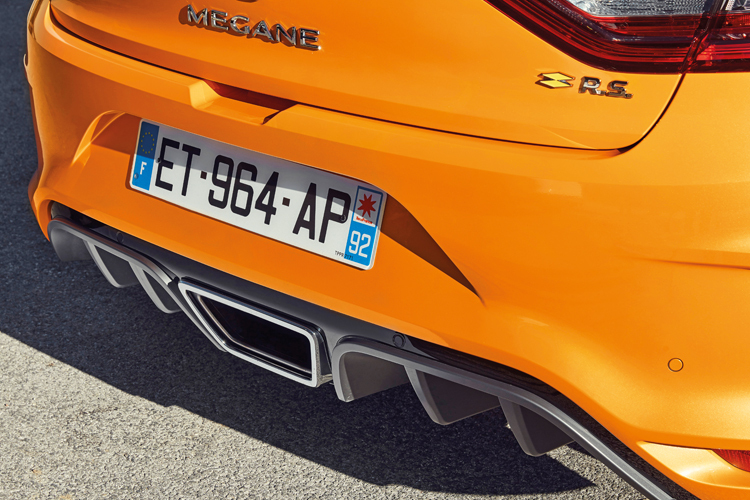 Apart from the “R.S.” and “Renault Sport” badges, the RS gets flared fenders incorporating air ducts, an F1-style front under-bumper blade foil and a prominent rear diffuser with an oversized central exhaust outlet. 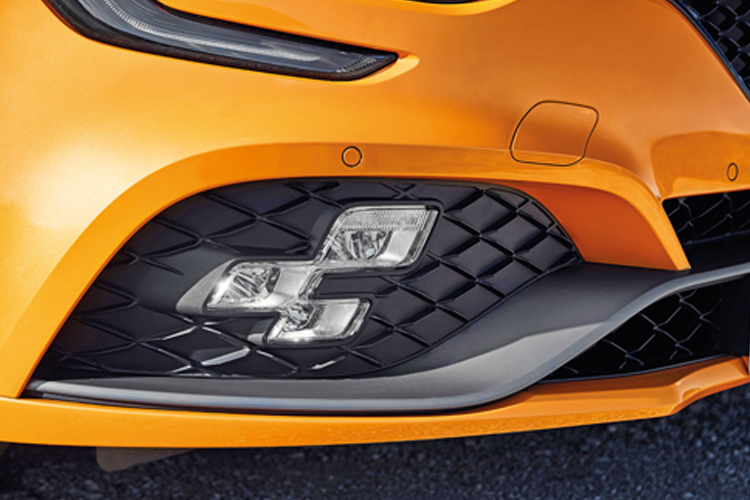 The headlamps are full LED, as is the “chequered-flag pattern” multi-reflector lighting system called R.S. Vision which is integrated with the front bumper, either side of the gunmetal-grey, F1-style front blade. 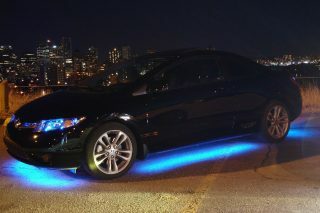 The system combines four lighting functions into each block of nine LEDs – side lights, cornering lights, fog lights and long-range (460m) high-beam lights. In short, the Megane RS is easily seen in the dark and looks speedy even when stationary! If the winged wonder that is the Honda Civic Type R is a little too over-the-top for your liking and you find the Volkswagen Golf GTI too understated and trailing on performance in today’s hot-hatch fray, then Renault’s latest RS rocket is the charismatic contender occupying the middle ground. Renault’s newly launched “Exocet” pocket rocket may have a couple of quirks, but it’s still a droolworthy Gallic charmer with sporty looks and genuinely athletic prowess. 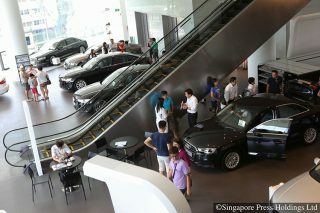 The five-door format and dual-clutch option boost the car’s market appeal beyond track-attack aficionados. Renault is already preparing a go-faster Trophy version with 300hp, 400Nm, bi-material brake discs (which reduce each wheel’s weight by 1.8kg) and the Cup chassis.